On a previous projects, we wondered if we could make some money for charity by selling the recycled toner bottles from our Ricoh printer. We were aware that used printer cartridges can be sold online to raise money for charity, so we wondered if the same applied to toner bottles. We contacted a number of charities to see if they would take our toner bottles, and The Dogs Trust were one of the charities who responded. Contact was made through a company called Clover Environmental who work in partnership with The Dogs Trust. They sent us two boxes along with instructions on what to do once the boxes are full. 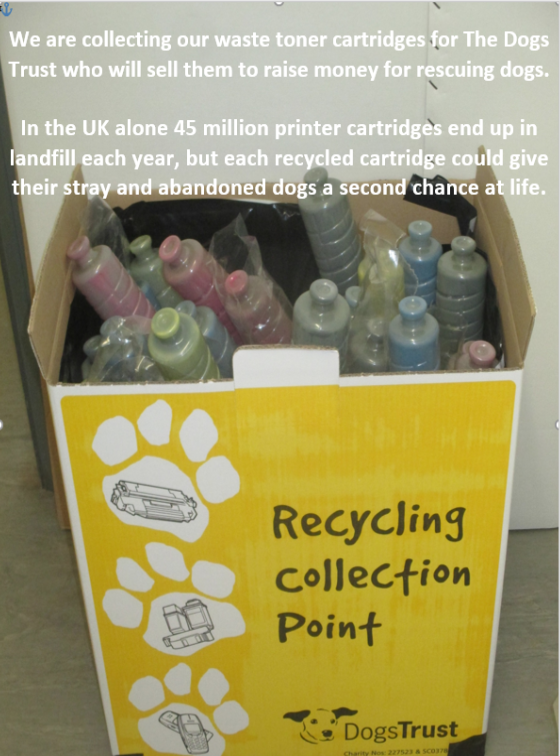 The money that the Dogs Trust raise through selling the toner cartridges is used for rescuing dogs to give them a second chance at life. Every penny raised goes directly to Dogs Trust and is used specifically to sponsor kennels in their re-homing centres. Each kennel costs £6,000 a year to maintain. Money raised from recycled goods like toner bottles, printer cartridges and other items provide food, treats, toys, veterinary bills and heating – in fact everything needed to give a dog somewhere to call “home”. Not only are we supporting the charity but we are also keen to contribute towards the prevention of 45 million printer and toner cartridges which end up in landfill ever year so this is a really worthwhile cause.